Liposuction slims and reshapes specific areas of the body by removing excess fat deposits and improving your body contours and proportion. Liposuction can be performed alone or along with other plastic surgery procedures, such as a facelift, breast reduction, or a tummy tuck. If you are bothered by excess fat deposits – located anywhere on your body – that don’t respond to diet or exercise, liposuction may be right for you. 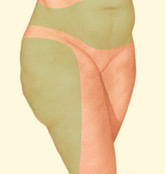 Liposuction is not a treatment for obesity or a substitute for proper diet and exercise. It is also not an effective treatment for cellulite-the dimpled skin that typically appears on the thighs, hips, and buttocks-or loose saggy skin. Liposuction should be performed in an accredited office-based surgical facility, licensed ambulatory surgical center, or a hospital. Be sure to arrange for someone to drive you to and from surgery and to stay with you for at least the first night following surgery. Be sure to ask questions. It’s very important to ask your plastic surgeon questions about liposuction. It’s natural to feel some anxiety, whether it’s excitement for your anticipated new look or a bit of preoperative stress. Don’t be shy about discussing these feelings with your plastic surgeon. Medications are administered for your comfort during the surgical procedure. The choices include local anesthesia, intravenous sedation, and general anesthesia. Your doctor will recommend the best choice for you. 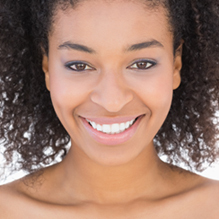 Liposuction is performed through small, inconspicuous incisions. First, diluted local anesthesia is infused to reduce bleeding and trauma. Then a thin hollow tube, or cannula, is inserted through the incisions to loosen excess fat using a controlled back and forth motion. The dislodged fat is then suctioned out of the body using a surgical vacuum or syringe attached to the cannula. Your improved body contour will be apparent once the swelling and fluid retention commonly experienced following liposuction subside. With continued practices of healthy diet and fitness, the loss of excess fatty tissue should be permanently maintained. However, substantial weight gain can alter the results. 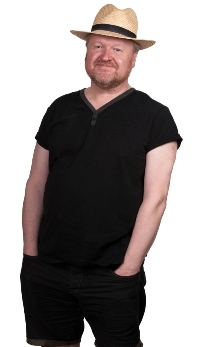 The decision to have liposuction is extremely personal. You will have to decide if the benefits will achieve your goals and if the risks and potential complications are acceptable. You will be asked to sign consent forms to ensure that you fully understand the procedure and any risks and potential complications. 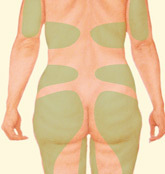 Once your procedure is completed, a compression garment or elastic bandages may cover treatment areas. These help to control swelling and compress the skin to your new body contours. In addition, small temporary drains may be placed in existing incisions beneath the skin to remove any excess blood or fluid. How long will I wear the compression garment? When can I resume normal activity and exercise?When do I return for follow-up care? It may take several months for the swelling to fully dissipate. As it does, your new contours and enhanced self-image should continue to develop. Your improved body contour will be apparent when the swelling and fluid retention commonly experienced following liposuction subside. The results of liposuction will be long lasting, provided that you maintain a stable weight and general fitness. As your body ages, it is natural to lose some firmness, but most of your improvement should be relatively permanent. Although good results are expected from your procedure, there is no guarantee. In some situations, it may not be possible to achieve optimal results with a single surgical procedure and another surgery may be necessary. 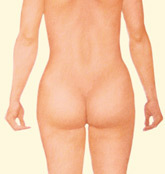 It is not possible to improve lax skin tone with liposuction. 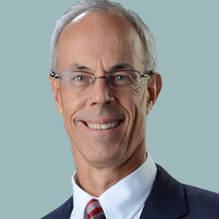 Following your physician’s instructions is key to the success of your surgery. It’s important that the surgical incisions are not subjected to excessive force, swelling, abrasion, or motion during the time of healing. Your doctor will give you specific instructions on how to care for yourself. Cost is always a consideration in elective surgery. A surgeon’s cost for liposuction may vary based on his or her experience, the type of procedure used, and geographic office location. Many plastic surgeons offer patient financing plans, so be sure to ask. The ABPS is recognized by the American Board of Medical Specialties (ABMS), which has approved medical specialty boards since 1934. There is no ABMS recognized certifying board with “cosmetic surgery” in its name. 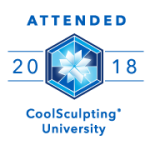 By choosing a member of The American Society of Plastic Surgeons, you can be assured that you are choosing a qualified, highly trained plastic surgeon who is board-certified by the ABPS or The Royal College of Physicians and Surgeons of Canada. This procedural information is intended strictly for educational purposes. Only models are depicted in these procedural information pages. It is not intended to make any representations or warranties about the outcome of any procedure. It is not a substitute for a thorough, in-person consultation with a board certified plastic surgeon. Also known as abdominoplasty, a tummy tuck removes excess fat and skin and, in most cases, restores weakened or separated muscles creating an abdominal profile that is smoother and firmer. 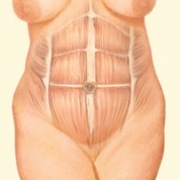 A tummy tuck is not a substitute for weight loss or an appropriate exercise program. 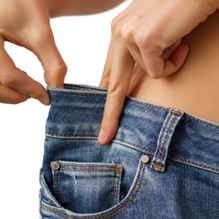 Although the results of a tummy tuck are technically permanent, the positive outcome can be greatly diminished by significant fluctuations in your weight. For this reason, individuals who are planning substantial weight loss or women who may be considering future pregnancies would be advised to postpone a tummy tuck. Also, a tummy tuck cannot correct stretch marks, although these may be removed or somewhat improved if they are located on the areas of excess skin that will be excised. The success and safety of your tummy tuck procedure depends very much on your complete candidness during your consultation. You’ll be asked a number of questions about your health, desires and lifestyle. A tummy tuck may be performed in an accredited office-based surgical facility, licensed ambulatory surgical center, or a hospital. If your tummy tuck is performed on an outpatient basis, be sure to arrange for someone to drive you to and from surgery and to stay with you for at least the first night following surgery. 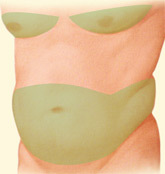 A full tummy tuck requires a horizontally-oriented incision in the area between the pubic hairline and belly button. The shape and length of the incision will be determined by the amount of excess skin. Once the abdominal skin is lifted, the underlying weakened abdominal muscles are repaired. 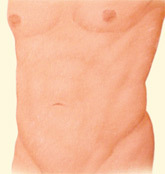 A second incision around the navel may be necessary to remove excess skin in the upper abdomen. The upper abdominal skin is pulled down like a window shade. The excess skin is trimmed and the remaining skin is sutured together. A new opening for the belly button is created. The belly button is popped through to the surface and sutured into position. Sutures, skin adhesives, tapes or clips close the skin incisions. Your tummy tuck will result in a flatter, firmer abdominal contour that is more proportionate with your body type and weight. The final results may be initially obscured by swelling and your inability to stand fully upright until internal healing is complete. Within a week or two, you should be standing tall and confident in your new slimmer profile. The decision to have a tummy tuck is extremely personal, and you’ll have to decide if the benefits will achieve your goals and if the risks and potential complications are acceptable. You will be asked to sign consent forms to ensure that you fully understand the procedure and any risks. Following your surgery, dressings or bandages may be applied to your incisions, and you may be wrapped in an elastic bandage or a compression garment to minimize swelling and support your abdomen as it heals. Small, thin tubes may be temporarily placed under the skin to drain any excess blood or fluid that may collect. How long will I wear the pressure garment? The final results of your tummy tuck may be initially obscured by swelling and your inability to stand fully upright until internal healing is complete. Your tummy tuck will result in a flatter, firmer abdominal contour that is more proportionate with your body type and weight. Previous abdominal surgery may limit the potential results of a tummy tuck. In women who have undergone cesarean section, the existing scars may be incorporated into the new scar. 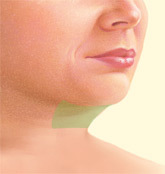 Scar may take several months to a year to fade as much as they will. Although good results are expected from your procedure, there is no guarantee. In some situations, it may not be possible to achieve optimal results with a single surgical procedure and another surgery may be necessary. Following your physician’s instructions is essential to the success of your surgery. It’s important that the surgical incisions are not subjected to excessive force, swelling, abrasion, or motion during the time of healing. Your doctor will give you specific instructions on how to care for yourself. 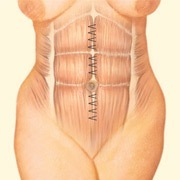 Prices for tummy tuck procedures can vary. A surgeon’s cost may be based on his or her experience, the type of procedure used, and the geographic location of the office. Many plastic surgeons offer patient financing plans, so be sure to ask. 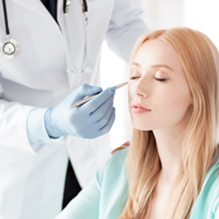 Most health insurance does not cover cosmetic surgery or related complications. You must carefully review your health insurance policy. When choosing a plastic surgeon for tummy tuck, remember that the surgeon’s experience and your comfort with him or her is just as important as the final cost of the surgery.